You can share this spelling list by copying the following code and pasting it inside an email or in your class's website. then choose an activity: Spelling test, practice, or one of the games. Tip: You can use the "Tab" or "Enter" key after typing a word. To save your list, type its title in one of the following rows, and click the "Save" button. To open a saved list, click the "Open List" button next to the relevant title. Please note: The lists are saved locally on your computer, in the browser's "cookie" file. Thus, if you erase the browser's history, the lists might get erased too. You can backup your lists. 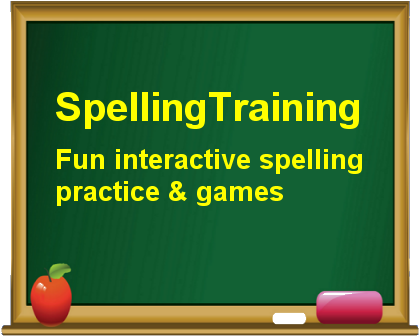 This website offers easy interactive spelling practice for kids in early elementary years (grades 1, 2, 3 and 4). Just type, listen and learn English - learning spelling can be as simple as that! In this page you set up which words to test students on. The next page - after you hit the “Online Spelling Test” button - lets the kids tackle the spelling test and check their performance. This free spelling website acts like an online computer program, in which you can create your own spelling lists, and have word games with your own words. All the games and the other educational interactive activities on this website are totally free! You can also use this website to learn how to pronounce English words. Each word is pronounced slowly and clearly, stressing and emphasizing each syllable and consonant. This makes it great for ESL students and special education students as well, helping to discover new English words and their correct pronunciation. This is a simple test in which you hear the words of your list in random order, and type them inside the text boxes. Do your best to spell them correctly. At the end, you can press the "Check" button to see how well you have done. If you made a mistake, you can click a mistaken word to see its correct form. You can also ask to repeat the test with only the mistaken words. This online practice will guide you step by step until you know how to write each word correctly just by hearing it. It consists of three phases: in the first phase, the letters to type are highlighted on the keyboard. in the second phase the word will still be presented, and you will copy it. In the third phase, you will type it from solely hearing it. These are two similar games, one in is more action themed, and the other is calmer. They practice reading the words and matching them to the words you hear. It's an easy reading activity, best for kids in 1st grade and 2nd grade. This is an action online spelling game. When you type correctly the words you hear, you can eliminate the sharks that are threatening the goldfish. The typing is under time pressure, yet you can press the "clue" button to have the word flashed on the screen. This activity can be challenging, and is more suitable for kids in 3rd grade and 4th grade. This is a classic hangman game, using your own words. It's unique because you can actually hear the hidden words. Immediately create a challenging online word search puzzle from your own list of words. After every word you find, you will hear it pronounced. The puzzles are dynamically created, and can sometimes be challenging even for kids in 5th grade and 6th grade. The lists are arranged in stages that coordinate to the children's development through spelling patterns, also called features. The beginning lists for first graders allow the kids to approach the words one sound at a time (i.e. initial consonants), to then building more of a sight word vocabulary (i.e. word families). Moving on from there, learners in second grade are able to chunk parts of words and process them more fluently when they read (i.e. consonant blends). Third graders continue the fluency of reading while they explore the meanings of words (i.e. silent consonants), while fourth graders can handle more complex spelling patterns (i.e. double consonant with e-drop). Of course, a student may overlap in stages, for instance, a second grader may still need some work on a few "first grade" features, or may dabble in some third grade features. They are merely an average "snapshot" for students in elementary school. Spelling and studying words ultimately promotes a greater interest in reading and writing. When a child has word understanding and vocabulary knowledge, all aspects of Language Arts are enhanced. Which English words would you like to study? Type them into the empty spaces above. Once you do, you can click on the “Listen” button to hear how the word you typed is pronounced. Sometimes there is more than one way to pronounce a word - for example, “read” sounds different in the past: “I read this book yesterday” to the way it sounds in the future: “I will read this book tomorrow”. In this case you can hit the “Alternate” button to switch between the different pronunciations and choose the right one. You can also choose from the word lists we've prepared already in the drop-down menu. When you have finished adding words, choose an activity from one of the green buttons. The spelling list will appear for the students. They should read it carefully and, when ready, start the activity. When finished, the students will have the option to restart the activity or to exit to the main menu. In most cases, they will also get the option to repeat the activity with only the words they had trouble with. Do you have a word you would like to add to those already recorded? Leave a comment below and we'll be happy to work on it! We'd also love to hear any other comments you have.